Directions: To download this coloring sheet, simply click on the image above to download the picture as a printable PDF file. We’ve also uploaded a higher resolution jpeg image for advanced editing. There is a little bit of background behind this coloring sheet. It was only last mother’s day we posted our first free coloring pages on this website. They were a logical next step to better serve you as you minister to kids. 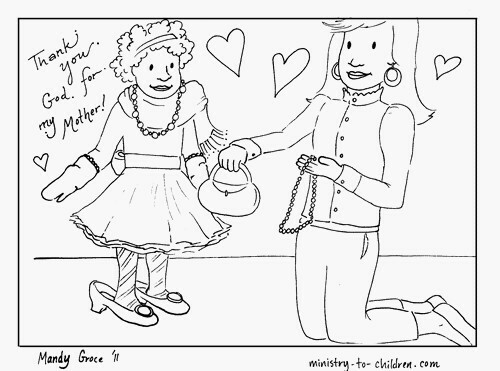 We now have well over 60 free Bible coloring pages including that first set of Mother’s Day coloring pages. 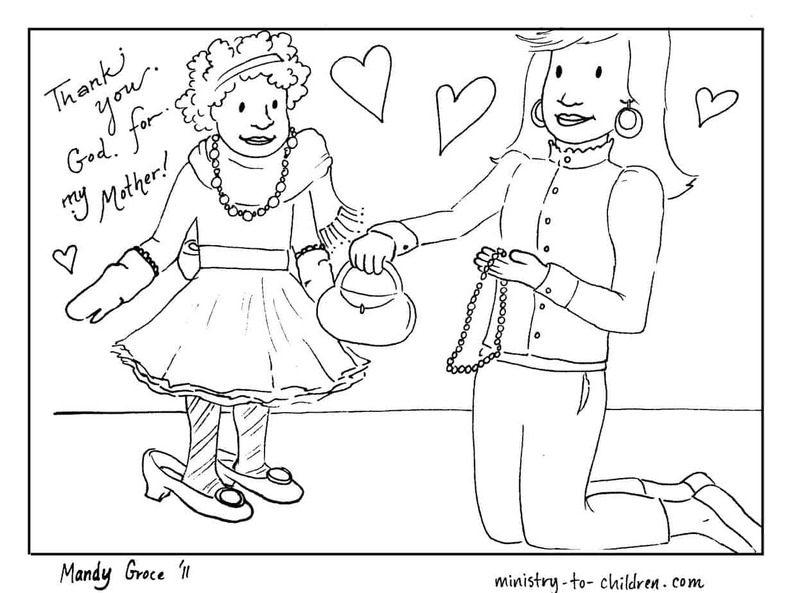 You might also enjoy our printable Mother’s Day Sunday School crafts. Update: We’ve created a new version of this picture that says “Mum” instead of “Mother” to account for regional variations. Click here to download it as a jpeg. Since then, I’ve heard from many readers asking us to include more people of color in our printables. This is not always easy with cartoon characters. We did not want to exaggerate physical features and create anything offensive. At the same time, we believe that God makes all different types of beautiful people. So here is our attempt at a mother’s day African-American coloring page. Please leave a comment below for Mandy if you appreciate her work. We would like to know what you think and be more inclusive in future efforts. Tony Kummer (Editor) reviewed & updated this page on : May 6, 2013 at 10:14 pm. All our content is peer reviewed by our readers, simply leave a comment on any post suggest an update.